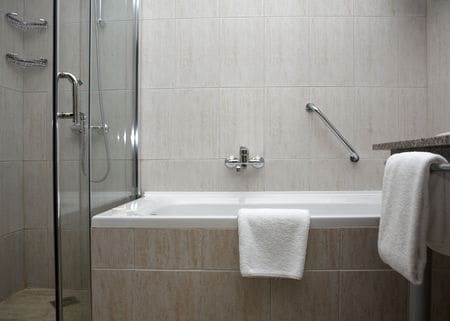 Looks are important, but bathrooms have to be very functional spaces – especially as tenants and their needs change. When you’re remodeling an apartment bathroom with tenants in mind, you’ll want to consider the type of people who typically rent that apartment (families, singles, etc. ), and the needs those people have. While you can’t anticipate everything, there are steps you can take to make sure the remodel works for as many people as possible. That can help you keep the apartment rented, with happy tenants who will take care of the place like it was their own. For example, if you generally rent to families with children (based on the local area’s population and the size of the apartment), you’ll want to make sure you have a bathtub and not just a shower in the bathroom. Parents need to be able to bathe small children, and having only a stand-up shower really doesn’t work very well for that. Small apartments that are typically rented only to singles or couples may not need a bathtub put in, although some people do love to soak in one after a long day at work. That’s an important consideration when remodeling any apartment bathroom. Having a bathtub and shower (either separate or combined) has the highest level of functionality for any apartment bathroom. It’s generally what you should strive for. If there really isn’t room or having both isn’t feasible, choose a shower instead of a tub and make it as large and comfortable as possible for your tenants. Tubs and showers aren’t the only areas of consideration, though. You also want to focus on the sink area. If there’s room in the apartment, most people like to have a double sink in the master bathroom and/or in a second bathroom. With a double sink, more than one person can get ready at a time. There’s typically more counter space, as well, which is popular with people who use a lot of different products and/or who have children. You don’t want to crowd the bathroom too much, but there are certainly ways to get as much counter space as possible into a small location. Exploring those kinds of options can really help you create a remodeled bathroom that your new tenants will love, and that will be very functional for them.